MIDDLETON-Rudolph C. “Rudy” Krofta, age 98, of Middleton, passed away on Feb. 2, 2019, at All Saints Memory Care. Rudy was born on Sept. 13, 1920, the son of late Rudolph and Mary (Kraus) Krofta. 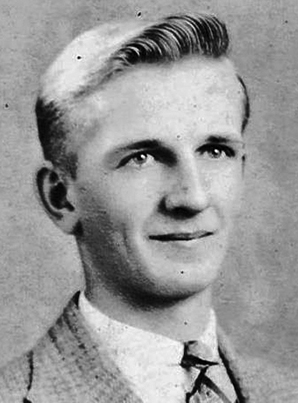 He graduated from Mishicot High School in 1939 and UW Madison Farm Short Course in 1941; and was employed at the University of Wisconsin Agriculture Experimental Farms of Madison and Arlington for 42 years as a mechanic and welder. Rudy married Florence A. Becker on May 10, 1947; they were married for 69 years at the time of Florence's passing in 2017. Rudy and his wife enjoyed going to dances, mainly in New Glarus where they enjoyed old time waltz and polka music. They traveled to places of interest, and their grandson, Matthew, looked forward to joining them on his summer vacations from school. Rudy served his country in World War II with the 541 Ordinance Company in England, France, Belgium and Germany. During the invasion on Omaha Beach (D20), he drove a landing vehicle with reinforcement troops on to Omaha Beach. Rudy and Florence lived the majority of their lives in the Middleton and Madison area. Rudy was always a good neighbor to those that lived near to them. Rudy and Florence were members of St. Bernard's Catholic Church, Middleton. Rudy also was a member of the Knights of Columbus and served as an usher for many years. His journey in this life has been completed. He gave his all. He is now at peace. Rudy is survived by his daughter, Cheryl (Ken) Fries; grandson, Matthew (Lindsey) Pufall; brothers, David of Mishicot and Raymond of Sturgeon Bay; sisters, Joyce Bavry of Manitowoc, Audrey (Roy) Harvey of Ogdensburg and Arlene Muehlenberg of Green Lake; sister-in-law, Carol Schiller of Verona; and many nieces, nephews and friends. He was preceded in death by his wife, Florence; brothers, Sylvester (Joan) Krofta, Norbert Krofta and James Krofta; sisters, Mary Ellen (Clarence) Schultz, Leona (Frank) Buresh, Anna Frechette and Joan Krofta. A Mass of Christian Burial will be held at St. Bernard Catholic Church, 7450 University Ave, Middleton, at 11 a.m. on Feb. 8, 2019, with Fr. Brian Wilk presiding. Burial will be at Resurrection Cemetery. Visitation will be held at the church from 9:30 a.m. until the time of Mass on Friday. In lieu of flowers, the family asks that donations in Rudy's name be made to: All Saints Neighborhood Family Heritage Program, 2445 Darwin Road, Suite 109, Madison, WI 53704. We would like to thank the staff at All Saints Memory Care and Agrace HospiceCare, along with his dedicated caregiver Wayan Glick for their time and attention.